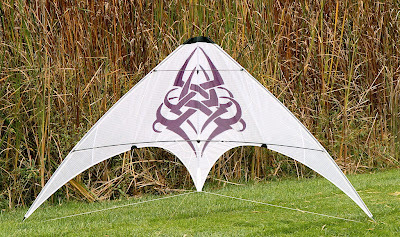 Don't forget that most SUL sail material is only made in white, like the special material the CTC Ghost is using. 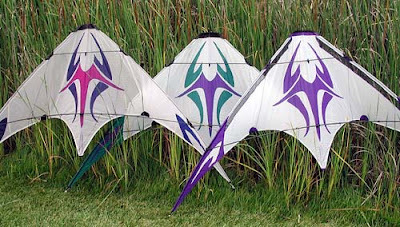 I like white kites for UL's or SUL's. But still like to have another color to give some pop to the kite. Plus white flies easier in light wind. This Vanishing Point was a favorite SUL. But white isn't just for SULs. I had a whole set made in white. ONE OTHER THING ABOUT ALL WHITE KITES IS THAT IT ALLOWS THE KITEMAKER TO SHOW OFF THEIR SEWING EXCELLENCE. I HAVE AN ALL WHITE KITE SEWN WITH BLACK THREAD AND THERE IS NOWHERE FOR ERRORS TO HIDE - ANY MISTAKE WOULD SHOW UP LIKE A SCAR ON A SUPERMODEL'S FACE. AND IT'S NOT A UL EITHER. ooh what does this button over here on the far left of the keyboard do. An overcast day and an all white Snowflake.